I can think of about a dozen instances when it would be useful to send e-mail at a designated time, rather than at the moment you click Send. For example, what if you're notifying some customers about a special sale--one that doesn't go live until tomorrow morning? Or you're traveling and want to remind a co-worker to perform an important task while you're away? 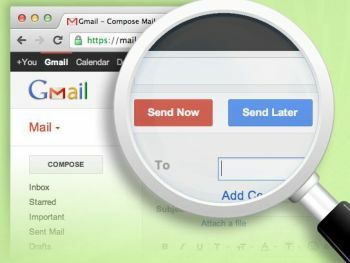 Sounds like you're a candidate for Right Inbox, a new browser extension for Gmail users. E-mail that's queued for later delivery gets stored in the Drafts folder, so you can easily review it and, if necessary, make changes. After an e-mail goes out, it appears in your Sent Mail folder like any other. Nice, right? A couple caveats. First, Right Inbox requires Chrome or Firefox; it's not currently compatible with Internet Explorer. Second, although the service is free while in beta, pricing plans are in the works for down the road. A free option will remain, though, probably one that limits the number of messages you can "send later" per month. I'd be remiss if I didn't mention Boomerang for Gmail, a very similar service that's also for Chrome and Firefox. Whichever one you choose, I think you'll love having this kind of control over your e-mail delivery. And they're great for setting e-mail reminders for yourself!